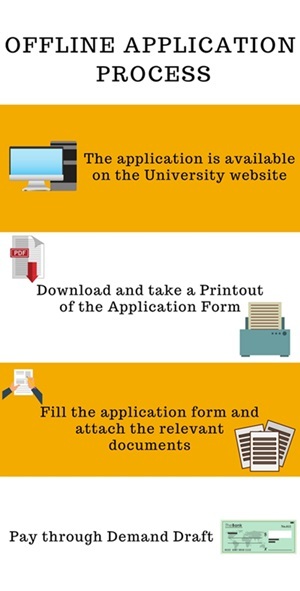 The application form is available on the official website of Manipal University, Jaipur. The new candidate has to register with the basic details to fill the application form. 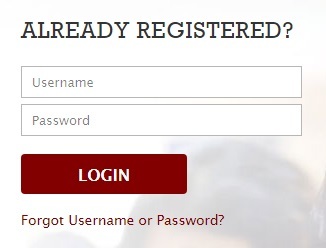 If the candidate is an existing user, they can log in with the Username and Password sent to the registered Email Id. The candidate has to select the Course and Stream in which he/she is going to proceed the graduation. The candidate has to provide Personal Details and Contact Information. The candidate has to enter his previous qualifying Academic Details. Finally, the candidate has to confirm all the details provided in the application form and proceed to payment. The application fees of INR 800/- must be paid Online using Debit/ Credit Card or Net Banking. 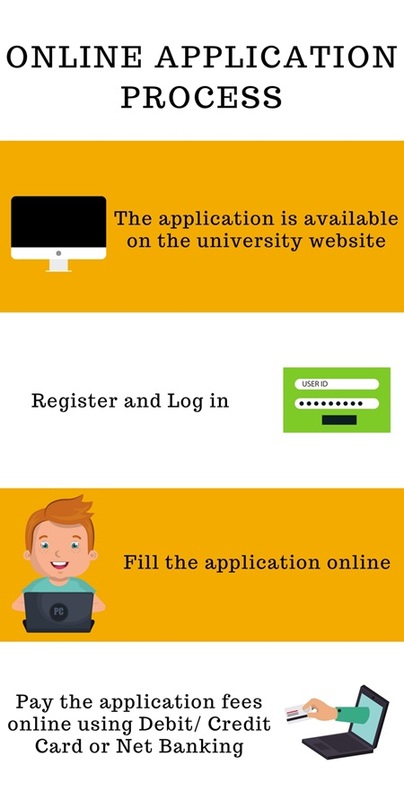 The application is available on the university website for the offline application. Download and take a printout of the application form from the website. Fill the application form and Attach the Marksheet of the previous qualifying examination. Pay the application fees of INR 800/- through Demand Draft in favor of “Manipal University Jaipur” payable at Jaipur. Marks secured in All India Manipal Academy of Higher Education Online Entrance Test (MAHE-OET) 2019. Based on the marks in the qualifying examination along with JEE / MAHE-OET ranks. Based on marks secured in Diploma and no entrance test will be held. The admission process is based on the combined marks scored in Academics 10/ +2/ Graduation, Entrance Test, Group Discussion, Personal Interview, Presentation & English Comprehension Test and the previous Work Experience. The merit list will be prepared on basis of the above examination to select the students for the programme. The admission process will be based on marks secured in All India National Aptitude Test in Architecture (NATA) conducted by the Council of Architecture (COA). The admission process is based on marks secured in the previous qualifying examination followed by Personal Interview. The admission process is based on marks obtained in the qualifying examination & MUJ Written Entrance Test. The admission process is based on marks secured in the previous qualifying examination. The admission process is based on marks obtained in the previous qualifying examination followed by Personal Interview. For Manipal University, Jaipur admissions 2019, the candidate must have passed 10+2 or A-Level or IB or American 12th grade or equivalent examination with Physics, English, and Mathematics as mandatory subjects, along with any one of the following subjects - Chemistry/ Computer Science/ Biotechnology/ Biology/ Statistics/ Engineering Drawing with minimum 50% marks. 10+2 with 50% in Physics, English and Mathematics as compulsory subjects and Chemistry / Computer Science / Biotechnology / Biology / Statistics / Engineering Drawing as an optional. A valid score in MAHE-OET / JEE Main. In order to get admission to Manipal University MBA course, the candidate must have passed Bachelor’s degree in any discipline from a recognized university with a minimum of 50% marks. The candidate must have a valid score in any Management Aptitude Test. In order to get admission in Manipal University, the candidate must have passed 10+2 standard or A-Level or IB or American 12th Grade or equivalent in any discipline with minimum 50% marks. In order to get admission in Manipal University, the candidate must have passed 10+2 examination with minimum 50% marks for General and 45% marks for SC/ ST category students. The candidate should be below 20 years and 22 years of age in case of SC/ST candidates as on the date of admission. In order to get admission in Manipal University, the candidate must have passed 10+2 examination with Physics, Chemistry, and Mathematics as mandatory subjects with 50% marks. The candidate must have passed 10+3 years Diploma in Mathematics as a mandatory subject with minimum 50% marks recognized by Central / State Government. The candidate must have passed International Baccalaureate Diploma after 10 years of schooling, with minimum 50% marks with Mathematics as a mandatory subject of examination. The candidate must have scored the qualifying marks in All India National Aptitude Test in Architecture (NATA) conducted by the Council of Architecture (COA). In order to get admission in Manipal University, the candidate must have passed 10+2 or its equivalent examination in any discipline with minimum 50% marks. In order to get admission in Manipal University, the candidate must have passed 10+2 examination in any discipline with Mathematics as a mandatory subject with minimum 55% marks. In order to get admission in Manipal University, the candidate must have passed 10+2 examination with minimum 50% marks. In order to get admission in Manipal University, the candidate must have passed 10+2 examination with minimum 60% marks. In order to get admission in Manipal University, the candidate must have passed 10+2 standard or A-Level or IB or American 12th Grade or equivalent in any discipline with minimum 45% marks. In order to get admission in Manipal University, the candidate must have passed 10+2 or A-Level or IB or American 12th Grade or equivalent in any discipline. The candidate must have passed 10+2 or A-Level or IB with Science or Computer science subjects, with minimum 50% marks to get admission. In order to get admission in Manipal University, the candidate must have passed 10+2 or A-Level or IB with Science or Computer science subjects, with minimum 55% marks. In order to get admission in Manipal University, the candidate must have passed Bachelor’s degree with a minimum of 50% marks for General and 45% marks for SC/ ST category students. In order to get admission in Manipal University, Jaipur, the candidate must have passed Bachelor’s degree in Law with a minimum of 50% marks for General and 48% marks for SC/ ST category students from a recognized University. In order to get admission in Manipal University, the candidate must have passed Graduation with one of the following subjects as a mandatory Economics/ Mathematics/ Statistics. 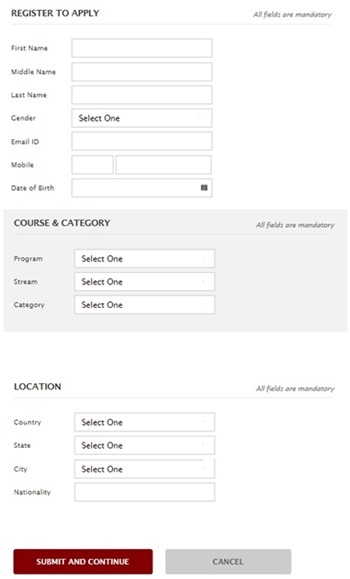 In order to get admission in Manipal University, the candidate must have passed Bachelor's Degree from a UGC /AIU recognized University with psychology or any related course (Child Psychology, Psychiatry, Educational Psychology, Counselling, Psychotherapy) as one of the papers are eligible with minimum 50% marks. In order to get admission in Manipal University, Jaipur, the candidate must have passed B.Com/ BBA or its equivalent exam with minimum 50% marks. In order to get admission in Manipal University, Jaipur, the candidate must have passed Bachelor’s degree in Planning/ Architecture/ Civil Engineering/ Architectural Engineering from a recognized University or equivalent with minimum 55% marks. The candidate must have passed Master’s Degree in Geography/ Economics/ Sociology from a recognized University or equivalent. In order to get admission in Manipal University, Jaipur, the candidate must have passed B.Sc from a recognized university with minimum 50% marks. The candidate must have passed Engineering with minimum 50% marks. The candidate must have a Bachelor's Degree in Science with minimum 50% marks in the concerned discipline like Physics/ Chemistry/ Mathematics/ Botany/ Bio-Science/ Bio-Technology/ Zoology/ Statistics as applicable from a recognized university. In addition, the candidate must have an aptitude for research. The candidates from R & D Institutions who are sponsored by their Institution and granted leave for two semesters will also be considered for the programme. In order to get admission in Manipal University, the candidate must have passed B.Tech / BE / AMIE in the respective/related Branch of Engineering with minimum 50% marks or equivalent CGPA. The candidate should have passed Any Public School/ Board/ University Examination in India or in Foreign countries recognized by the Association of Indian Universities as equivalent to 10+2 examination. The candidate should have passed International Baccalaureate Diploma after 10 Years of Schooling, with minimum 50% marks. The admissions into Manipal University Jaipur are done on the basis of rank in the All India Manipal Online Entrance Test (MUOET). The eligibility criteria is: The candidate must have passed 10+2 or A Level or IB or American 12th grade or equivalent examination with Physics, English, and Mathematics as Compulsory subjects, along with any one of Chemistry or Computer Science or Biotechnology or Biology or Statistics or Engineering Drawing as optional subject for admission to B Tech, with minimum of 50% marks in Physics, Mathematics and the optional subject, put together. I took the MOUET-2015 and secured a rank of about 11k. The cutoff at my time for IT was 20k. Bug the cut offs change every year. Manipal University requires 50% marks in 12th Board Exam from Science stream. MUOET is Manipal University Open Entrance Test which is common to all the branches of Manipal. The cut off varies from year to year. The cut off for Mechanical went to 25,000 ranks in MUOET. The eligibility criteria for BA LLB HONS in Manipal University Jaipur is minimum 45% in 10+2 standard affiliated to any board. There is no such entrance exam for admission in Manipal University. It is a decent option for a law student if one does not make it through. We should have at least 50% in PCM in order to eligible for admission.MUOET is the entrance exam through which we can join MUJ. The exam is of 180 marks out of which 110 is the cutoff for CSE. If the score is around 100 you are eligible for all other branches. 10th and 12th class mark sheet will be taken into account for admission at Manipal University. Cutoff may be around 60%. For admission, we need to have 60% marks in Mathematics, Physics, and Chemistry. The students need to appear in an entrance exam which will be conducted by the college and the rank should be 3000 to 4000. I haven't given any entrance examination till now. Above 50% in PCM in 12th boards. There is MU OET entrance exam for this Institute to get admission. Every year it varies, in 2015 fo mechanical it was around 36000 all India rank. To get the admission in this college the student must pass the 12th grade with the good percentage and there will be a personal interview conducted in this college. The university is well equipped with state of the art infrastructure. The faculty needs to have more teachers with actual industrial experience. Board marks of 10th and 12th exams are considered. There is no need of other exams like JEE MAIN. Minimum 60% in 12th is needed. The student must pass the 12th grade with good percentage and NATA is the entrance exam to get the admission in this college. Eligibily criteria is on basic of their internal exam.there MUOET exam for this.till 10k rank u are eligible for cse branch. The student must pass 12th exams. More than 50% aggregate is necessary. JEE MAIN marks are not completely important. Admission will be done on the basis of MIT entrance exam. They have different cutoff according to the branch. Admissions are based on MU OET rank and if it's around 8000, then its really easy to get into this college. At Manipal University, an entrance exam is compulsory for every student. MU OET is the entrance exam to get the admission in this college. For my stream cut off is around 13,000. I gave MU OET 2018 entrance examination for the admission and its cutoff varies every year. MU OET 2018 is the entrance exam to get the admission in this college. The cutoff is around 25,000. The eligibity criteria is 12th pass and the entrence exam is manipal university entrence exam. Entrance exam has to be cleared to get the admission in this college. What are the hostel fees and facilities at Manipal university? The Hostel Fee or any part of it mentioned in the Hostel Fees Structure table above will be “Non-Refundable” under any circumstances, after the commencement of the academic session. What is the address of Manipal university? Dehmi Kalan, Near GVK Toll Plaza, Jaipur-Ajmer Expressway, Jaipur, Rajasthan 303007 is the address of Manipal University. What is the fee for BHM at MUJ? What is the fee structure for BHM course? Fee structure at Manipal University, Jaipur for BHM is given below. Total Course Fee - INR 605,000. When is the last date to submit the admission application for BJMC at Manipal University, Jaipur? The last date to apply/ submit the application for BJMC is 15 May 2017. What is the hostel fee at MUJ? Is there any deposit to be paid along with the hostel fee?